Scallop meat is shucked at sea off Harpswell, Dec. 17, 2011. Maine’s scallop season is ending for the year amid hopes that fishermen had a stronger season than they did a year ago. Fishermen harvest Maine scallops with dragger boats or by diving for the shellfish and collecting them by hand. The dragger season is over, and the dive season is finished everywhere except southern Maine, where it officially ends April 20. 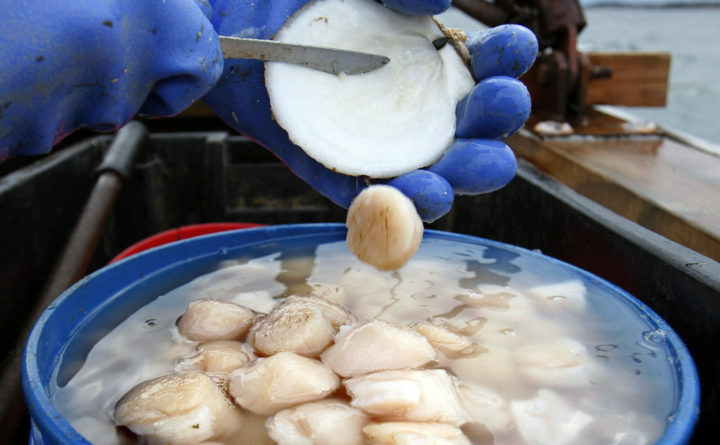 The state’s scallop fishery has rebounded from a low point in the mid-2000s, but it took a step back last year after several years of steady improvement. Fishermen harvested a little more than 560,000 pounds of scallop meat in 2018, down from more than 800,000 in 2017. The 2017 harvest was the most in 20 years. State fishery managers said scheduled closures likely played a role in the drop.